• Bokamoso Impact Investments is a social enterprise dedicated to connecting the impoverished rural populations of South Africa to opportunity via empowerment, using diverse entrepreneurial platforms as change catalysts. • Bokamoso Foods is a subsidiary of Bokamoso Impact Investments, a 100% black women owned food and beverage company. The mission of Bokamoso Foods is to bring the delights and health-benefits of high-quality foods and beverage products to the world. The synergy of our fine-tuned production process and consistency in delivering best quality products will enable our customers to experiences unique standard and specialized blends of our range of beverage & Foods. Bokamoso’s goal is to see the company expanding and excelling in the food & beverage industry, generating enough profit for shareholders to create more job opportunities and to continually empower young people in rural and township environments. • Bokamoso has their own blending operation and various products have been developed and produced in- house. Bokamoso has the capabilities, in addition to their own packaging specifications, to tailor pack and distribute client or third party pack sizes for weights between 2g -25kg pack sizes. Raw materials are sourced from reliable suppliers and then packed down or blended according to a specific recipe or packing method. Bokamoso has invested in an agricultural accelerator (www.bokamosoimpact.co.za) in the desert of the Kalahari, North West Province. Bokamoso introduces innovative agricultural solutions to poverty, incubates local rural entrepreneurs, facilitates market connection and tackles lack of basic resources with commercial strategies and natural asset mobilization. Lesego is the co-founder and chairwoman of Raise the Children International (www.raisethechildren.org), a registered nonprofit here in South Africa, USA and UK. 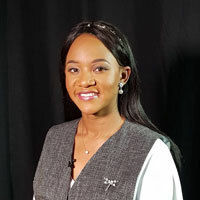 Lesego believes in education-based solutions to poverty. Raise the Children identifies self-motivated orphans from impoverished and rural communities and mobilizes resources for these children to gain access to higher education that leads to employment and public service with a high return on social investment. Lesego was recently given public recognition by President Jacob Zuma on June 16, as a young Achiever and Trail blazer for her impactful work in rural communities. She was also featured on the 2017 Mail and Guardian 200 young South Africas. She also won the 2017 Standard Bank Top women award in Agriculture.